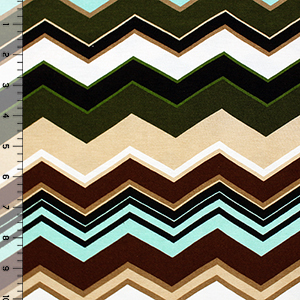 Sophisticated colors of forest green, dark brown, mint, and light taupe multi chevron design on a white soft cotton spandex rayon blend knit. 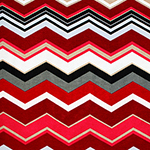 Fabric has a soft hand, good 4 way stretch, a nice drape, and is light to mid weight. Chevron rows measures 2" (see image for scale).